Symbolism: The Angels of Harmony are attended by the most beautiful birds of the air, flocking to the sanctuary of their peaceful spirit. Symbols of flourishing concord, the songbirds show the sense of harmony that good relationships can give us. Gifts for human beings: They can help us to live a harmonious life; seek out people and places which are harmonious; help us to express our spirits in a harmonious way. 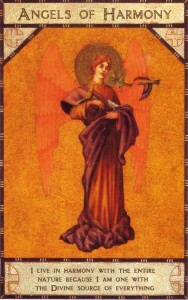 The Angels of Harmony share their grace with us when we choose to live a harmonious life. Living in harmony entails many things. It has a physical aspect, which can be found in the environment we choose to live in. It is also an emotional state, reflecting the degrees of openness, honesty and integrity we bring into our lives. We live in harmony, in part, when we accept our dependence on the earth which nourishes us and supports life. We are in harmony with our feelings when we give them the space to be real for us. Living in harmony with ourselves means we honour our special gifts. When we live in harmony with universal truth we seek to give of our best and to receive with an open heart. Living in harmony is an actual energy state, from which we may experience life in an optimal state to flow. This means that we want good, wholesome food to enrich our bodies, and we avoid all forms of substance abuse. We need to have enough rest and recreation on a regular basis and to do work that is both creative and emotionally satisfying. Play, rest, good friends, beauty and spiritual stimulation are all vital ingredients in a truly harmonious life. To live in harmony with our deep inner nature is to live in accordance with universal truths. These truths exist in all religions and are accepted among all cultures throughout the ages. They are the basis of an ethical code which respects the dignity of the individual. We live in harmony when we release the past and process out our negativity. Holding on to negative energy is the basis for disharmony and is known as disease. Lastly, we find gratitude in our hearts for all the good things we have been given. Gratitude will always give us the sense that we are living in harmony. We can appeal to The Angels of Harmony to help us find the right path to harmony, and can ask for assistance in honouring whatever we may require to make our lives more joyful and creative. Harmony is a balance between the spiritual, emotional and physical planes.